You’ve spent the last few hours searching for a productivity app to solve your procrastination problem forever. You find the perfect one. It’s free! You download it only to find the ads annoy you. The “upgrade to premium” pop up gets on your nerves. But, you battle on and then BAM: you can’t add any more tasks unless you go premium. No way! You decide not to be stingy and give a poor developer $0.99 ($1.50 tops) for a good app with no ads and full functionality! Well done, you’ll soon be in a productivity flow that no one can touch! Your newly paid, super duper-premium-no ads app keeps crashing. You can’t sync to iCloud. You don’t have Dropbox, but you sign up hoping the Dropbox sync works. All those tasks you spent hours entering. Pen and paper? No, because your Moleskin won’t send you a notification to remind you to start your report. 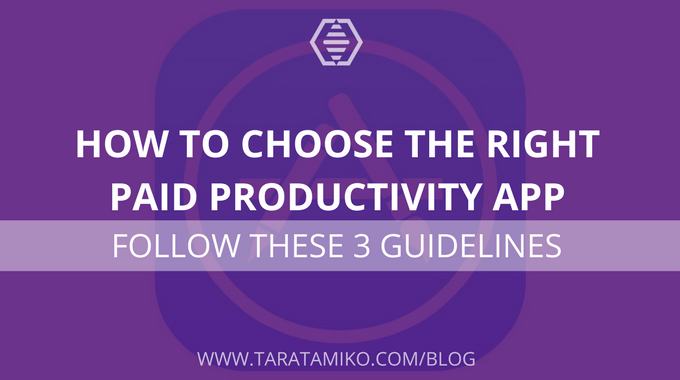 Simply follow these 3 guidelines so your app of choice is worthy of your time and money. 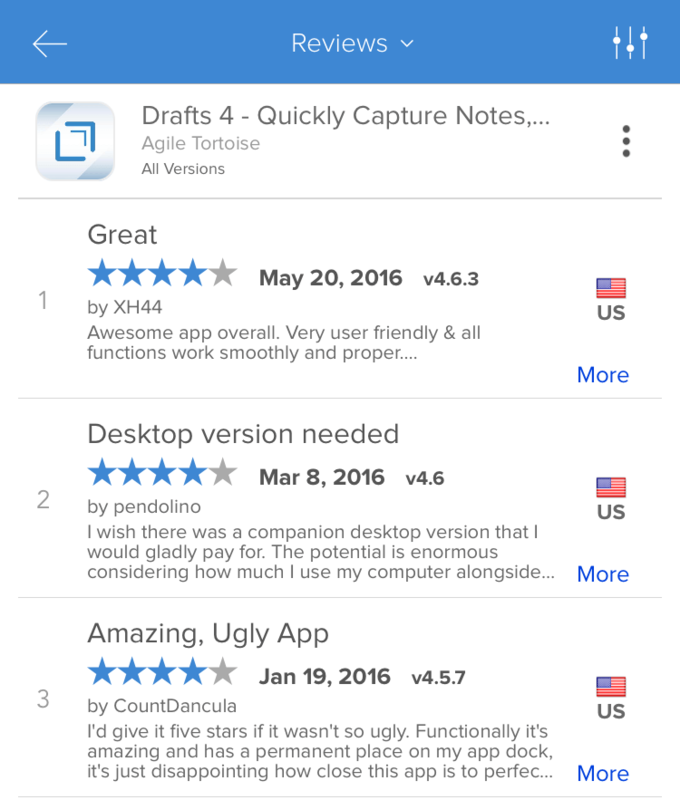 You probably look at the apps’ screenshots, icon and the number of reviews it’s received. However, you need to check the date and version history first. 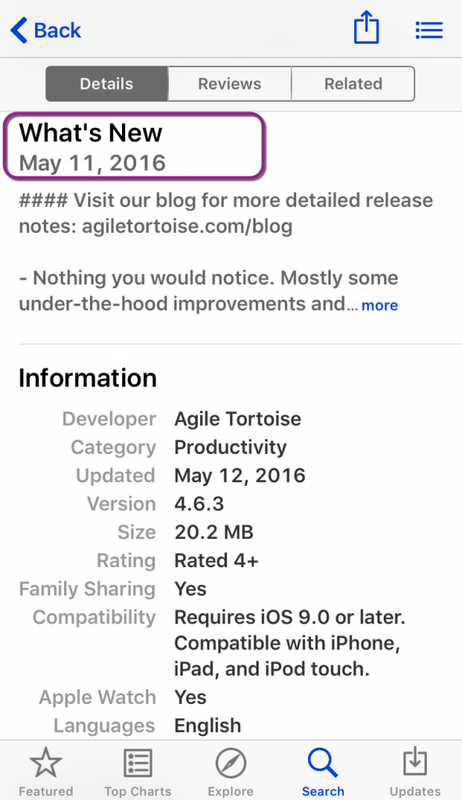 Let’s take a look at Agile Tortoise Drafts 4 app. 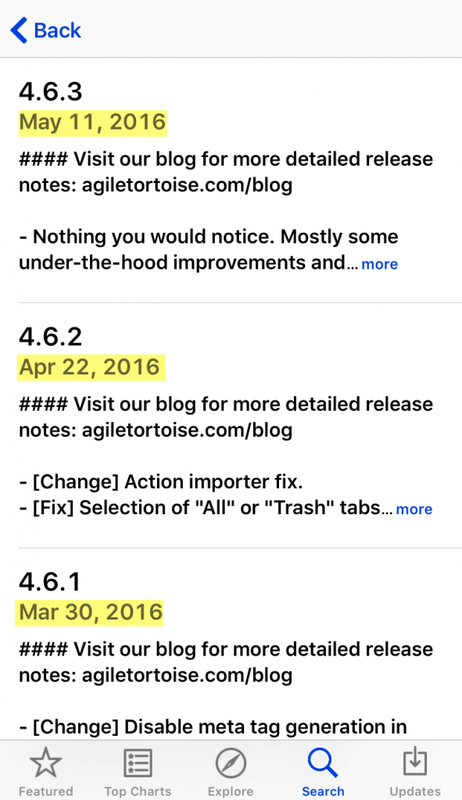 If the What’s New date is over three months old, it’s likely the developer isn’t supporting the app and hasn’t been updated to include the latest version iOS version history. Discard it and move on to the next app. If it’s looking pretty decent, a month or two off, you can scroll down to Version History which will tell you how new an app is, and how often they upgrade. Now, I’ve heard countless people complain that an app is crap yet they’ve not updated their iPhone’s software (operating system) since iOS5. 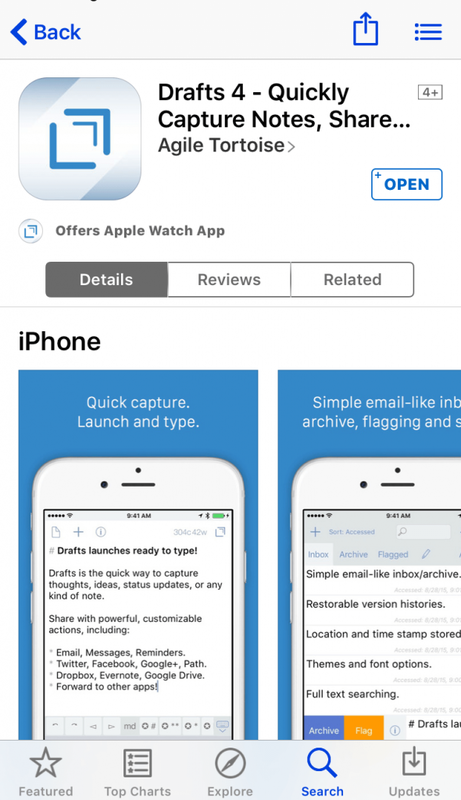 Apps that are worth our time and money will be in the latest iOS version. So if you’re not there, or you’re still using your iPhone 4S, you’ll be limited in your choice of good apps. Check your software version and make sure your phone operating system and the app you wish to invest in are singing from the same song sheet. It’s worth taking the time to read of other people’s experience with using the app to learn from them and save you time and money. But how to decipher the reviews when there’s a mix of glowing reports and dissatisfied app users? Easy, always go for the middle. Reviews with 3 stars will help you cut through the “family & friends” of the app developer reviews (they tend to leave 5 stars) and the I-didn’t-check-my-phone-was-compatible-reviews (they will leave a 1 star). In addition, be mindful of reading the reviews based on the current version of the app. Older reviews will refer to problems that the app developer has rectified in the latest version. Avoid any unnecessary surprises, check for in-app purchases. Typically reserved for free apps, a handful of paid apps will offer extra features for at a price. These simple guidelines should help you find the right paid app for you and can be applied to all types of apps, not just productivity ones. Did I miss anything? Please share how you choose your apps. Send me a tweet or leave a comment below. Twitter’s secret search weapon – Do you use them? Yes it tough to find appropriate apps. Paid Apps are good and best for use. .
Agree. Nothing worse than having people complain about an app…that’s free! But I think it’s important to make sure when you buy a paid app that you check it’s being regularly updated. ??? ?